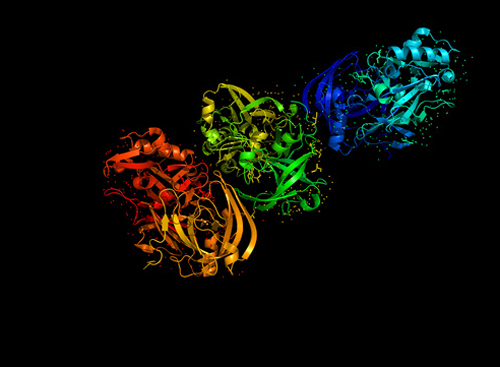 A high resolution raytraced ribbon model of beta-secretase - a protein that is important in forming healthy peripheral nerve cells, but is also involved in the onset of Alzheimer's disease. Are these practices standard in your lab? For many diverse areas in life, people have developed so called “10 golden rules” that aim to guide others in the right direction in that specific field of interest. This document is not an exception. Here you find 11 golden rules designed to be an educational guide and function as a basis for the standard practices for handling biological samples in a laboratory conducting proteomic experiments. Plan ahead: Any good experiment starts with a thorough plan of how it should be conducted, what the end points are, and how they should be evaluated. Before the onset of an experiment, the unknown should be the result, not how it is going to be performed. A poorly planned and conducted experiment will most likely fail. Therefore, consider the number of biological replicates and include sufficient numbers to enable statistical analysis. Sampling, extraction, and analysis run order must be randomized through the whole experiment. Avoid group-wise processing as it may introduce a bias in the results. Understand the nature of the risk: Samples are alive and external stimuli can cause changes in sample composition. Depending on biological context, changes can both increase as well as decrease an analyte of interest. Changes are the result of residual enzyme activity, e.g., protease, kinase and phosphatise activity, as well as nonenzymatic changes, e.g. oxidation or a result from contamination by proteins from unintended sources such as skin keratin. Measures should be taken to abolish activity as fast as possible to minimize change during sample preparation. Residual enzymatic activity can persist even under adverse conditions, e.g., denaturing buffers, in the presence of enzyme inhibitors, below freezing point, and in alcohols. Analyze and know your workflow: To adequately address these unwanted changes, it is vital to understand the risk of change during each step. Go through the workflow step by step and identify the risk of degradation or contamination. Redesign and include measures to minimize or abolish the risk of proteomic change. By knowing the sources of change, extra care can be taken during certain critical steps and by including appropriate controls, the level of change can be estimated and potentially corrected. Perform time interval studies to understand the changes occurring after sampling as well as in extracts. Document your efforts: A sample is only as useful as its documentation allows it to be. For future use and interpretation of results, it is vital to document as much as possible about the sample and how it has been collected, handled and stored. Follow the MIAPE (Minimal Information About a Proteomics Experiment) guidelines and add whatever else is needed for full documentation. Poorly documented samples are worthless at best and potentially very costly. Prepare, prepare, and prepare: Use appropriate tubes and chemicals of high purity. Prepare material, e.g. collect, weigh, and label, such that everything is ready before starting sample collection. A written sampling plan and time scheme with marked pauses will help a lot during extensive sampling. You might want to make a dummy dry-run with all material and people in place so that everyone knows what to do and how to do it as well as make sure all needed materials are in place. Practice makes perfect: Practice sampling. This is especially important when taking samples from animals! Removing accurate samples from lab animals in a fast and reproducible manner is an important skill and requires a lot training to perfect. This may mean that you need to add a few extra animals or at least start with the least interesting samples in your experiment. The importance of proper sampling cannot be overestimated: Good sampling should be reproducible over the whole sample series in order to minimize intra-sample variation. The clock is ticking: During the time from sample collection until the sample has been inactivated, either permanently by using heat or temporarily by freezing, the proteome is subject to changes due to molecular responses to changing conditions. Strive to keep this post-mortem time short and reproducible between samples and record it for each sample. Differences in post-mortem times between samples create proteomic differences in and between populations, which may disturb the expected results. Protection and contamination: When it comes to proteomics, protection is as much about protecting yourself from the sample as protecting the sample from you and the environment. Keratins are ubiquitous and special care should be taken to avoid introducing them into your sample. Dandruff, hair, skin, wool sweaters, and anything that has been in contact with them (e.g., the outsides of your gloves) are some of the more common sources of keratin. NEVER reuse gloves or use powdered gloves. This must be held in mind whenever proteomic samples are handled. Saving samples for later: Samples MUST be stored frozen at least at -80°C preferably at -196°C. In local areas with high-salt or -protein concentrations, water can be prevented from freezing, resulting in pockets with liquid solutes where enzymatic activity can cause continuous protein change. Freeze drying, loss of water from frozen samples, is a slow but continuous process that risks altering the sample in cold storage; minimize empty space in sample containers, preferably by vacuum packing. Using stored samples: Eventually it’s time to use the collected samples and extract proteins for analysis. Enzymatic activity will resume in frozen samples once thawed, resulting in further change especially since membrane integrity may have been lost, allowing enzymes access to new substrates. To avoid this, samples should be pulverized while frozen. Great care should be taken to avoid partial thawing and refreezing. Add buffers to the still-frozen powder. Carefully select buffers for good extraction and to protect the analyte you want to analyze. Choice of extraction buffers is a balance between wanting to extract as much as possible while not interfering with downstream analysis. Detecting destruction: Even with the best intentions and preparations, proteomic change can occur resulting in individual outlier samples or overall drift. By introducing quality monitoring steps at key points, loss of quality can be detected and a sample removed or experiment aborted, reducing overall cost while improving the chances of success. Quality markers in combination with careful sample documentation may enable an understanding and correction of proteomic change. Mats Borén, Ph.D., works as Head of Development at Denator.